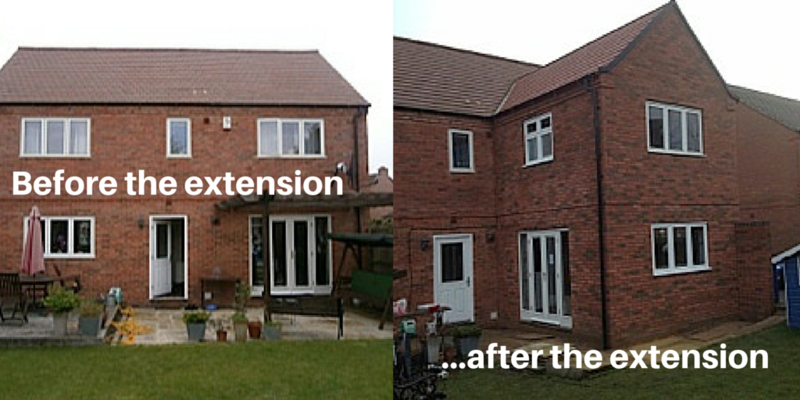 We were approached to provide a full architectural and building service for the construction of a two storey extension on the rear of the property to provide an additional bedroom, a family room and partial remodelling of the interior. Mawsley Village is a unique greenfield development where the local Planning Authority have clear guidelines to ensure that any additions do not have an impact on visual amenity or any adverse effect on neighbouring properties. Great care was taken in the design process with the proportions of the roof, elevations and external openings; facing brickwork and roof tiles were carefully selected to match the existing, timber windows and doors were custom designed and manufactured locally by a specialist joinery company. With one minor amendment, the planning authority granted Planning permission in September 2014 following a short mobilisation stage, site works were commenced with a contract duration of 10 weeks. All phases of the site work were supervised by local authority Building Control to ensure full compliance with the Building Regulations. During the latter part of the works, the client requested that the ceiling in the new bedroom was required to be at the same level as the existing without a downstand support beam. The Construction Director in conjunction with their associate structural engineer developed a detailed solution which was both practical, and did not create any delay in the programme. The clients, Mr and Mrs Keeler were very clear about their requirements from the outset of the project and were delighted that the team who completed the work to a high standard to meet the brief, within programme and to budget. During the course of the work we were approached by a number of local residents who complimented us on the work and subsequently there have been a number of enquiries and recommendations for similar projects.